I must admit that I was very excited when Lance and Julia Williams announced their Kickstarter project for an insulated hammock a few years ago. What intrigued me was the simple all-in-one design and promise for a entry-level and cost-conscious price point. I helped fund the first Bison Bag on Kickstarter, which was designed with a parachute nylon hammock integrated into a rectangular polyester sleeping bag. The concept was solid, but the execution on the first edition needed some refinement. I consulted with Lance on some upgrades, which they incorporated into the second version, the G2. I was sent a G2 for this review. The Bison Bag G2 can be described as an insulated hammock, or even as a hangable sleeping bag. The basic design takes a standard rectangular sleeping bag and slips in a hammock, centered through the bag. The sleeping bag is sewn to the hammock on the head and foot ends and along one of the long sides where the zipper is located. The ends are gathered together with a short length of rope loop. A zipper runs along the length and bottom sides. It has double zipper pulls so that the foot end can be unzipped and vented. Attached to the zipper side is a large stuff sack. The sleeping bag wraps around the hammock, which provides a double layer below the hammock, suitable to stow additional insulation or storage. 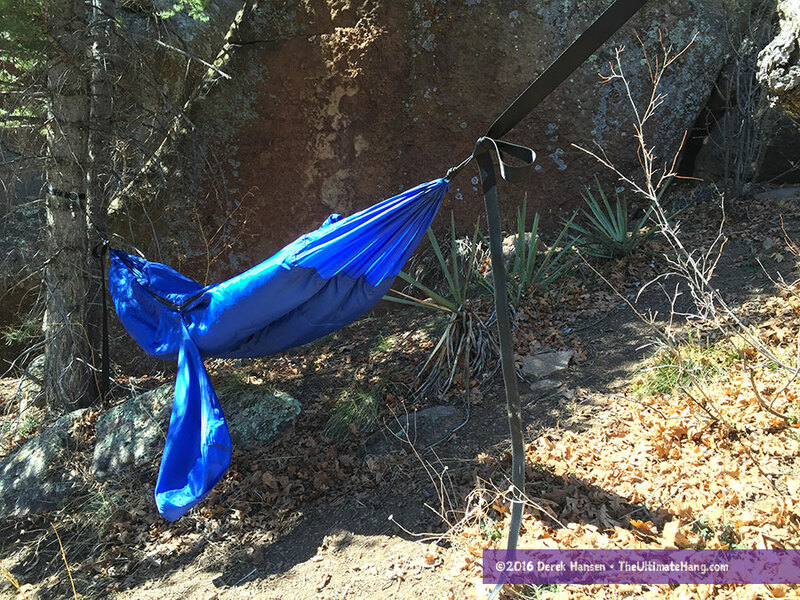 One reason I was so excited about the design of the Bison Bag is because I believe it is a great all-in-one solution for new hangers to try hammock camping. By integrating both top and bottom insulation, the Bison Bag provides a sleeping kit that doesn’t require much more to make the hammock viable in the outdoors. Several years ago at a Boy Scout weekend camping trip, I had a few scouts trying hammocks. One scout, intent on not being left out, decided to take his sleeping bag and convert it into a hammock. He took some rope and tied it on to both ends of the bag and hung it next to his buddies. I was surprised it held through the night, but it ended up being a great idea. The Bison Bag vastly improves on this improvised idea. The big limitation of the Bison Bag is its size, particularly for the hammock. The dimensions are lean, but the proportions are right, meaning that the hammock is wide enough for its length. I’m 5’10” and I feel that I’m at the limit for the length of this hammock. This is because when sleeping in a hammock, your torso nestles into the the central quadrant of the fabric, when laying on the most comfortable diagonal position. Because the sleeping bag is centered on the hammock, this means that I slide down into the sleeping bag more in hammock mode. You can lay inline in this hammock, but I don’t ever recommend that position as it puts more strain on your lower back and curves you in an unnatural “banana” shape. The big advantage of this product is its versatility. Not only is it an insulated hammock, making the issue of staying warm less of a learning curve and issue, but the Bison Bag can be used on the ground as a traditional sleeping bag. Anyone considering this hammock must accept that it is intentionally compromised to get the most of two worlds. It’s a challenge to say the least. The rectangular sleeping bag allows for a better diagonal lay, which is an improvement over other convertible sleeping bag options, but the hammock size does limit the range of people who might feel comfortable in the hammock. I really like that the design provides a double layer. This means that you can slip in a sleeping pad between the hammock and the sleeping bag to bump the temperature rating in cooler months. The top portion of the sleeping bag can also be unzipped and tucked into the hammock to create a thicker under quilt. A secondary liner or bag can also be added to make the hammock work in a broader range of temperatures. The foot end can also be vented in hotter months. The Bison Bag is a value-based product. It uses inexpensive fabric and fill and components. Construction is mid-tier with a few loose strands and seams. After repeated use, the attached stuff sack eventually popped its seams and I eventually removed it. The sleeping bag feels like your typical big box off-the-shelf “value” bag you might use for summer camping and family trips. For a combination sleeping bag/hammock, I feel the price is set just about right. For its size, quality, and weight rating, I feel like this product is great for new hangers, especially youth. I have no hesitations in recommending this hammock to youth groups looking for an all-in-one product that can get them in a hammock and sleeping bag without a big dent on the checkbook.